Most of the elms that gave New Haven its nickname perished in the mid-20th century from Dutch Elm disease. whose vows should have saved them from that very torture. The city’s windows gaped open like parched mouths. had already begun their quiet dying. to Orange and back again in the lush, forgiving shade. with reflected rivulets of Cape Cod rain. tosses in her bed, too restless to let me sleep. and father sleep on the other side of the wall. I hear their breathing between gusts of rain. the house itself become a womb. In color-graphemic synesthesia, letters or numbers are associated with colors. my mind swirled with color. were the sources of all. I thought: 2, 3, 4. "Is it you or the Moon?" Arabic saying, upon seeing a person one has not seen for a lengthy period of time. 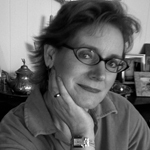 CLAIRE ZOGHB's work has appeared in Yankee, Connecticut Review, CALYX, Saranac Review, Mizna: Prose, Poetry and Art Exploring Arab America, Natural Bridge and Through A Child’s Eyes (an anthology on children and war). A Pushcart nominee, Claire was the winner of the 2007 Dogwood annual poetry competition and several of her poems were selected as finalists for the 2007 and 2008 Rita Dove Poetry Prize. Her first collection, Small House Breathing, won the 2008 Quercus Review Book Award and will appear in autumn, 2009. She lives with her husband in the Morris Cove section of New Haven and works as graphics director at Long Wharf Theatre.